Improve internal communication in your organization between HR and Employees, your Investor Relations Department and your Sales Force. Consolidate all of the different content that employees, partners and customers need to see – while still controlling its look, feel and who can access it. Publish information to the web without the help of an IT department. Improve customer and partner relationships by providing them with the information they need at the right time. Cut call center or help desk costs by providing sales representatives, customers and partners with self service access to information. with an interface that unifies many applications into a meaningful and consolidated web experience? What if you could have a live solution up and running in less than a month? Let us introduce you to WebSphere Portal NOW. – A reusable and extensible software template for WebSphere Portal that solves a majority of your intranet content portal needs immediately. – Services from Royal Cyber Inc. expert consultants to have your site in production in less than a month. Employees benefit by having broader access to company information. Portals can offer employee self-service functions. That means less reliance on a help desk, more time to innovate on products and services. By providing secure, role-based access to information and companies ensure the accuracy of information their employees can access. This also helps lower your overall information storage costs. Customer satisfaction is essential to the health of any business. A secure, interactive & compelling web experience greatly enhances the way a customer feels and relates to a business. Using a portal to help customers self-serve is also good for your bottom line — helping control call center and other costs. 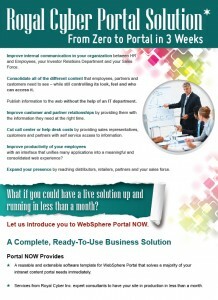 The Portal NOW template lets you jump-start a Web Portal Solution. You can start with a manageable scenario, measure immediate success and grow from there. A project can be a simple and low budget effort to start. Then, based on evolving business requirements, you have infinite options to extend and add other capabilities. And it relies on the industry’s leading portal – WebSphere – so you are in good company. WebSphere Portal structure for a preconfigured environment with two Web 2.0 themes, including a Home Page with links to critical information, feeds, documents, processes and applications. Ready to use Services, such as application or web site links, RSS feeds, same time contacts, calendars, document management, people finder, integration with social media and Google Gadgets. and Portlet Factory composite application support with single sign on. Optional Services to add support for Lotus same time, complex extranets and additional customer environments. Globalization soon to be available in 16 Languages. Includes translation guides to facilitate other local translations. The Portal NOW template is available from Royal Cyber team. We use a proven deployment methodology to crisply define your business goals, to install and configure the solution, then to train your team. An intranet scenario can be live in 16 days. This can easily be extended to support additional uses.